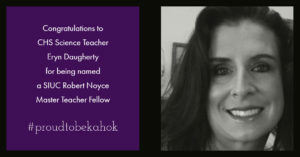 February 2019 — Collinsville High School Science Teacher Eryn Daugherty has received a Southern Illinois University Carbondale Robert Noyce Master Teacher Fellowship. River Region Master Teaching Fellows in Environmental Sustainability is a 5-year graduate fellowship for teachers who already hold a master’s degree. It is funded through a grant from the National Science Foundation. According to SIUC, the program “helps highly qualified STEM teachers in the region modernize their curricula and address local environmental problems.” Fifteen teachers were chosen for the fellowship. “We take a class in fall and spring, and then in the summers do 3 weeks of research. The overall goal is to bring this information and research back to the classroom and teach students how to do more true environmental research and bring STEM topics to diverse learners,” explained Daugherty. After completing the program, Daugherty will receive a Graduate Certificate in Environmental Sustainability.